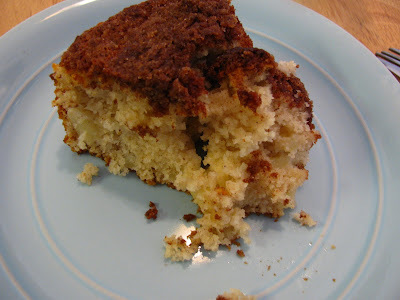 Recipe adapted from Johnny Appleseed Coffee Cake, found here. Combine all ingredients but apple, beat vigorously 1/2 minute. Fold in apple; pour batter into greased 8 or 9-inch pan. Combine first 3 ingredients. Cut in butter until mixture is crumbly. Sprinkle over coffee cake; bake at 375 for 20-25 minutes.